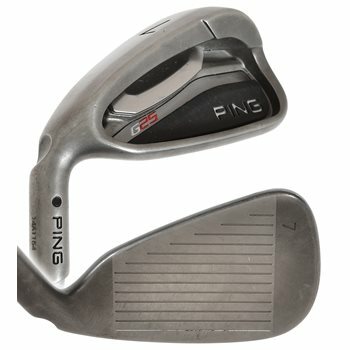 The Ping G25 iron set offers game-improvement technology for golfers of any skill level. Its sleek head inspires confidence while its custom-engineered face structure ensures a solid feel and distance with control. The progressive sole widths help optimize CG placement for accurate distance gapping. The result is high trajectory, distance, and extreme forgiveness all rolled into one iron. I have a set of LH 2015 XR Calloway 4-PW, speed step 80 steel, I have hit them less than 10 times, they are like new. Having trouble hitting them. I want to go back to pings, I am looking at your used G 25's. Can you tell me what you would give me for a trade for the calloway's, so I could purchase the used pings from you? The trade in value for your set is listed in the trade-in center located at the top right hand portion of our home page in blue color. Please go through the trade-in selector to populate exactly what you are sending us for make, model, shaft, dexterity, flex and configuration and it will provide you the trade-in value to be expected. will you bend the g25 irons up 2 more degrees ? Are the no label shafts zz65? You’ll see it towards the bottom of the shaft. How many degrees is the AW?